Our son is eight now and reads, writes, and talks fairly well, but it took us a while to get him started. One of the challenges we found was that a lot of the books weren't really engaging for him. What we did find that really worked for him, and gave him a start into reading sentences, was a game where you could build a sentence up out of words (a bit like this Big Box of Sentence Building). We found that our son really liked making silly sentences - in particular, I remember once he made "the cat ate the baby" and was laughing so hard that he went red in the face and almost started having an asthma attack! We continue to have difficulty encouraging him to read, because although he can do it he doesn't find a lot of interest in it. 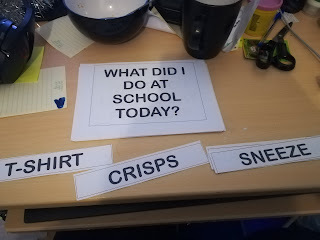 My son found it very funny, while allowing him to do some reading and speaking, he also came up with some new answers which was nice to see a bit of imaginative play.